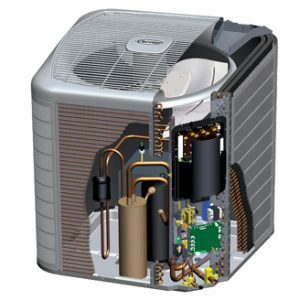 Heat pumps are typically vapor-compression refrigeration devices that transfer thermal energy in both directions. They can be reversible, working in both directions to provide heating or cooling to internal spades. The majority of the energy for them comes from the outside environment, with some energy that comes from electricity or another high-grade energy source needed to run a compressor. Heat pumps use a refrigerant to absorb the heat where it vaporizes, then releases it in the condenser, allowing the energy to transfer efficiently at relatively long distances. Heat pumps are a good alternative if natural gas or propane are not readily available or are not an option at all. They are more popular in areas that have moderate climates and can be very efficient as they simply transfer heat, rather than burn fuel to create heat. If you have any questions about heat pumps for your home or business, please do not hesitate to contact us. We provide a wide variety of heating and cooling services, including installation, repairs and maintenance.